The Falcons are back at home Sunday as they battle the Arizona Cardinals, looking to recover after their first loss of the season last week in New Orleans to fall to 8-1. The Cards are 4-5, and while they have played musical QB’s this season due to injury, this week the team will have John Skelton under center once again for the injured Kevin Kolb. Two weeks ago the Cardinals played competitive in their 31-17 loss at Green Bay. Skelton threw for 306 yards with a TD and INT, and WR Larry Fitzgerald, caught six passes for 74 yards with a touchdown. Fitz has just one 100-yard receiving game on the season and that came in Week 3. He had seven receptions for 83 yards in a 41-7 loss at Atlanta on Sept. 19, 2010. Cardinals coach Ken Whisenhunt said he would not hold back from making changes in his lineup this week, and did just that, as rookie Nate Potter is expected to start at left tackle in place of D’Anthony Batiste on a line that has allowed an NFL-high 41 sacks. 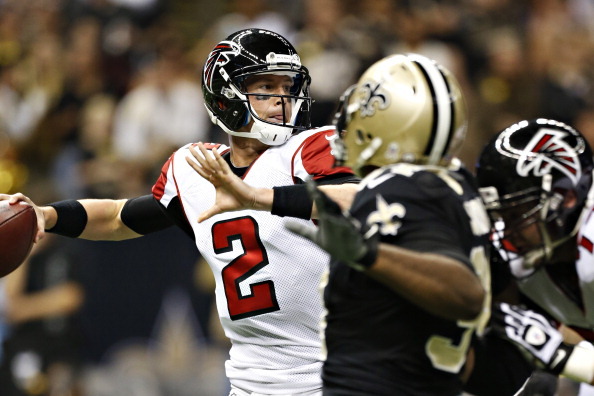 Despite the loss to the Saints, the Falcons appear to be an extremely confident group. They led 10-0 in the first quarter and nearly erased a 28-17 fourth-quarter deficit, but failed to convert twice from the New Orleans 1-yard line and was stopped on fourth-and-2 on the same drive with less than 2 minutes to play. Matt Ryan threw for 411 yards with three touchdowns and one interception while Tony Gonzalez caught 11 passes for 122 yards and two TDs. Atlanta’s inability to produce against one of the worst run defenses in the NFL, though, played a big part in the defeat. Michael Turner was held to 15 yards on 13 carries and the Falcons totaled 46 yards rushing. The Falcons allowed the Saints to rush for 148 yards and star tight end Jimmy Graham caught seven passes for 146 yards and two touchdowns. The Falcons shook things up Monday when they released veteran defensive end Ray Edwards, who started four games this season and had nine tackles and no sacks. Atlanta ranks 20th in the league allowing 365.6 yards per game, and it will try for a better defensive performance against an Arizona team that is 31st in total offense at 295.4 yards a contest and scoring at 16.0 points. The Cardinals are last in the league with 76.2 yards per game on the ground. The Falcons are smelling blood in the water after the loss last week, and look for their defense to have a big game against Skelton, and for them to pound the Cards into the ground to get to 9-1 with relative ease winning at home. Who Wins the Cardinals at Falcons Week 11 Battle?